Kauai is the perfect Hawaiian Island if you are looking to escape work and unplug. When you combine stunning scenery with five-star resorts and amazing food, you really can’t go wrong! Much of Kauai is only accessible by boat or air, and most of the island is still undeveloped which is a stark difference from the skyscrapers of Oahu. Kauai is the setting for over 60 films and TV shows. When you look at pictures of the spectacular scenery, you’ll see why. The Na Pali Coast is 17 miles of jagged sea cliffs covered in amazing lush foliage. The best way to explore this coast is by boat. Take a sunset sail and enjoy a glass of wine while watching the sun set on this untouched coast line. Waimea Canyon is Hawaii’s answer to the Grand Canyon. The canyon is 14 miles long, 1 mile wide and over 3,600 feet deep. 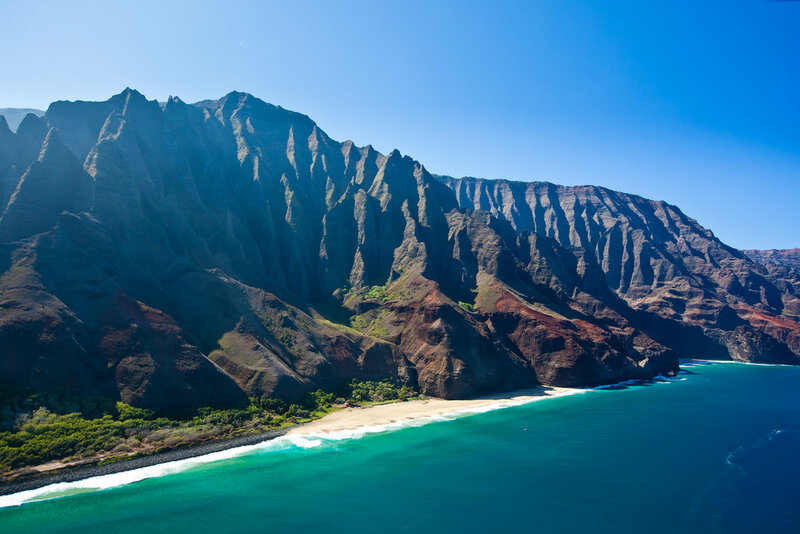 The canyon in combination with the Na Pali Coast makes Kauai the best place to take a helicopter ride! If you’re idea of unplugging is finding adventure, Kauai is the perfect destination for you. Kauai has the only navigable rivers in Hawaii and the Wailua River is the perfect place to kayak and hike up to stunning waterfalls. If you need more adrenaline, you can zip-line and ride ATVs in Kauai as well. If relaxing on the beach is more your speed, Kauai has 50 miles of perfect white sand. Take time to explore the different beaches on all four sides of the island. Each beach offers something different! My favorite hotel on Kauai is the Ko’a Kea Hotel and Resort. This boutique hotel is a nice change of pace from the mega hotels found on Maui and Oahu. With only 121 rooms, the Ko’a Kea is the perfect place to relax and recharge. Located on Poipu beach, you can choose between the perfect white sand and the Ko’a Kea’s serene saltwater pool. Photo Courtesy of Ko'a Kea Hotel and Spa. To find delicious dining, you don’t have to go very far. The hotel’s Red Salt Restaurant is helmed by Kauai native, Noelani Planas, and offers up sophisticated modern Hawaii cuisine. The best part about Kauai: perfect weather all year round! You don’t have to worry about finding the perfect week to take off. Just go and you’ll be greeted with perfect 80-degree weather! Are you ready to escape the daily grind yet? To being planning your escape to Kauai, contact me here! Older PostFour Eco-Lodges For The Perfect Escape!